Too often the process of setting and evaluating goals becomes transactional. When the big picture is lost, we rarely accomplish something that makes us proud. This simple process helps us anticipate the needs of our organization and develop meaningful team and individual goals. Step One: DEAR Time (Drop Everything And Read.) This helps us back away from the day-to-day things we are dealing with and look from a broader perspective. I usually find one article that forecasts HR trends that we all read and then we each pick things that sound interesting. We spend a hour or so reading. Step Two: Brainstorm trends and observations that may impact our work in the future. The last time we did this exercise, we came up with ten workplace trends that are impacting our work. 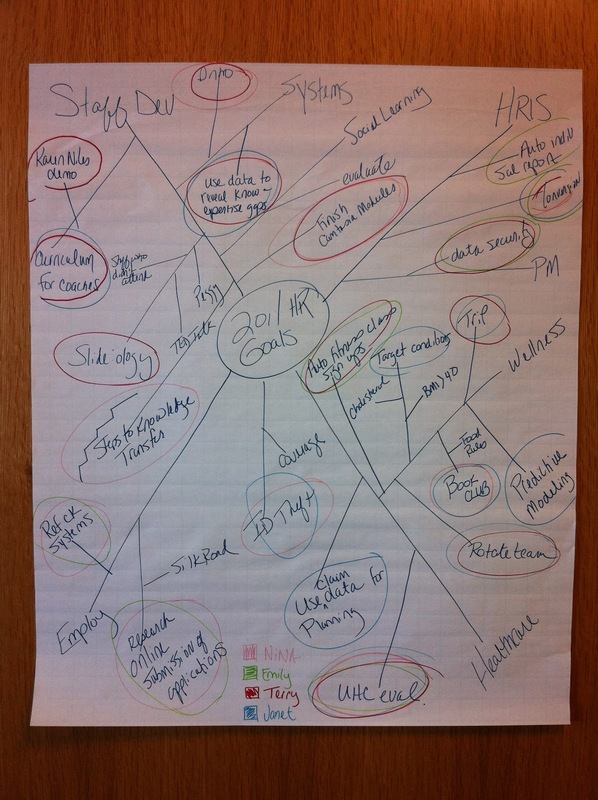 Step Three: Brainstorm team goals. We mind map ours. Step Four: Select two people to work on each goal and identify the point person. (This stems from my belief that you shouldn’t put all your eggs in one basket.) We each pick a different color marker. I circle the goals with the color selected by the people that will work on them. Step Five: Convert your mind map into a nice neat spreadsheet that linear thinkers can read and you can use to track progress. If you have a lot of goals, categorize them by priority. Step Six: Develop individual goals in whatever format you use in your organization. At this point it’s helpful to note any resources that will be needed or any learning that will need to occur to accomplish each goal. Many people in our organization also focus on how they will measure and evaluate each goal at this time. I find that we are pretty in sync after completing the steps above and that this is not essential for us. I'm a believer in sharing your goals whether they're team goals or individual goals, but I explored another perspective on that in this post. Who's your willpower role model?